Robert De Niro (The Intern) picks up his latest pay check in the 2015 action-filled crime thriller Heist. 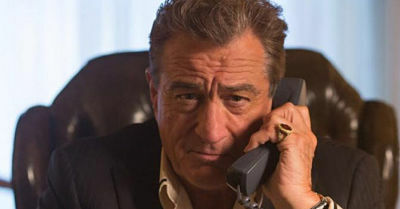 Robert De Niro means business as a gangster who’s casino is robbed in Heist. Directed by Scott Man and also featuring Kate Bosworth (Still Alice) and D.B. Sweeney (Fire With Fire), the R-rated Heist didn’t receive much love from the critics when it was dumped onto 24 theaters in November. Ditto for its take at the box office ($50,000). That said, it’s currently available On Demand. The Heist home entertainment release is abetted with bonus features including interviews with the cast and crew, “The Making of Heist” featurette, deleted/extended scenes, and audio commentary with director Mann, writer Max S. Adams, and actor Morgan.